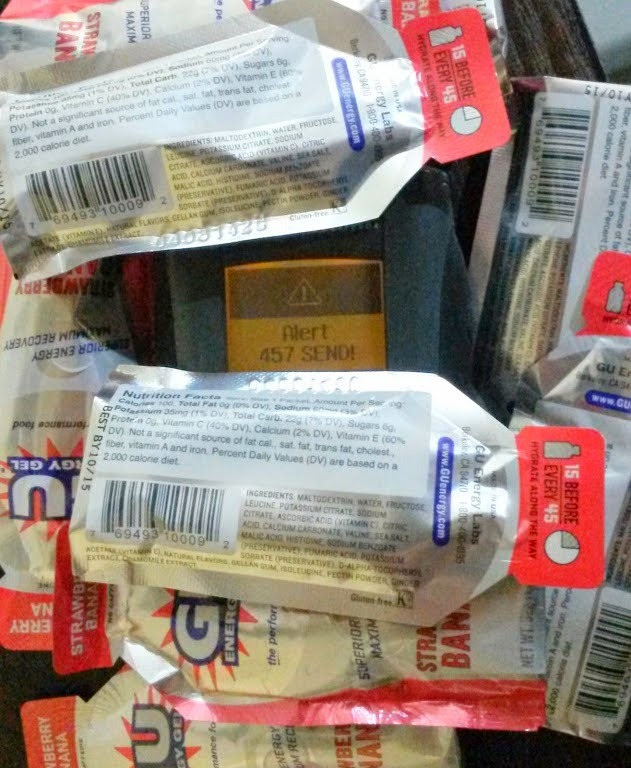 Mammut Avalanche Safety: My Gu packets interfere with my beacon!?? Really? My Gu packets interfere with my beacon!?? Really? It’s summertime, and few of us have avalanche beacons occupying our attention (if you do, please send a postcard!). Nevertheless, the other day I was part of a conversation that readers of this blog will find very interesting. It started as many of these do, an email from an acquaintance about his buddies’ beacon. I replied that the “457 Send Failure”(LINK) screen prompt is actually there to alert you when your beacon experiences EXTERNAL interference from an electrical, metallic or magnetic object. My friend, Steve Achelis of www.Beaconreviews.com , knows his stuff and remarked that they were way up on Mt Rainier where there should not have been any interference, and that none of the other group members had a problem. Steve said he’d forward my email to his friend so he could send his beacon in for testing. “A combined test of avalanche beacons and Gu -- this is like my life's calling! Jonathan was kind enough to let us link to his photos and explanation of his test here: (click on the photo and the captions will appear in the upper right) LINK to Photos and Results . In short, Jonathan pretty much proved that carrying Gu packets right next to any transmitting avalanche beacon could potentially cause a serious problem, and he did it in a way that all of us can easily wrap our heads around! There has been a lot of discussion in the last few years about interference with beacons, especially with the popularity of wearable video cameras, but this is the first time I’m aware of that anyone has shown this in a way that so many people can relate to, and with an object that most people would not think could cause a problem. In a followup email, a representative from Gu confirmed that their packaging does contain a very thin layer of aluminum foil, which accounts for the degraded signal. Many other common packaged items also have a thin foil layer in them, so we all need to be vigilant about this issue and not take anything for granted. Thanks Steve and Jonathan for illustrating this so clearly! We hope this serves as a reminder for people to carry their beacon separated from electronic, magnetic or metallic objects--including wrappers--in order to avoid this issue. Mammuts general recommended separation from any of these objects is 20cm when transmitting and 50cm when in receive. Be aware that regardless of the distance, your Mammut beacon will alert you if it IS experiencing interference with its signal--a PULSE Barryvox will beep 5 times and prompt "457 Send/Search Failure", while an ELEMENT Barryvox will flash "E3" or "E4" (error code 3 or 4) depending on whether it is sending or receiving. This alert is your cue to separate your beacon from anything that could be degrading its performance. Lastly, if your beacon needs a diagnostic checkup (recommended every 3 years) now that it's summertime and most of us wont be skiing for a few more months, it's the right time to do this! Simply give our Mammut Customer Service a call at (800) 451-5127 and they can hook you up with everything you need.